Many investors wouldn’t even consider adding marijuana stocks to their portfolio. They think most pot companies are scams or that the companies aren’t capable of turning a profit. Marijuana stocks are about to have a major breakthrough. In fact, there are seven reasons why the best “pot stocks” can deliver market-beating gains to investors over the next decade. Best of all, most investors still haven’t caught on to these reasons. That’s whyMoney Morning is bringing them to your attention now, so you can be ahead of the curve – before the marijuana industry really takes off. On Aug. 1, the U.S. Drug Enforcement Administration (DEA) could reclassify marijuana as a Schedule II drug, which would make it legal in all 50 states with a prescription, according to the Santa Monica Observer. A reporter from the newspaper questioned a DEA lawyer about the DEA’s alleged plans to legalize marijuana. On the condition of anonymity, the DEA lawyer confirmed the allegations. Even if the change doesn’t take place, marijuana use is still becoming more and more acceptable in the United States every year. If there’s anything governments love, it’s more tax revenue. And that’s what legal marijuana sales give them. Just look at what happened in Washington and Colorado in 2014. Each state has legalized recreational marijuana use and collected around $70 million in tax revenue from marijuana sales, Time Magazine and CNN reported. That’s about twice as much revenue as Colorado generated from alcohol taxes, according to analysts from the ArcView Group, a marijuana research firm. In 2015-2016, Colorado is expected to bring in $135 million in cannabis taxes. 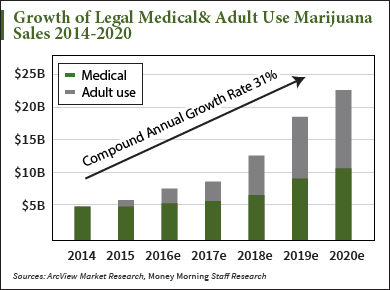 The U.S. marijuana market could be worth $30 billion annually by 2020, according to a 2015 report from the Bank of America Merrill Lynch, the first of such from any major financial institution. That’s three times the yearly revenue of the National Football League, at $10 billion, The Washington Post reported. Many people think that the marijuana industry is solely businesses that sell pot. But that’s far from true. Some grow marijuana, while others make apps for pot sellers and users. Some even sell tools and equipment to help people grow and cultivate marijuana. The marijuana industry’s wide breadth gives investors a lot options about where to put their money. And because it dips in all sorts of sectors, from tech to agriculture, the pot industry has plenty of room for future growth.